Top 5 Friends Thanksgiving Episodes Of All Time - Bold Outline : India's leading Online Lifestyle, Fashion & Travel Magazine. Turkey dinner alongside some Friends’ epic Thanksgiving episodes – isn’t that the best way to celebrate the holiday? We strongly think so. 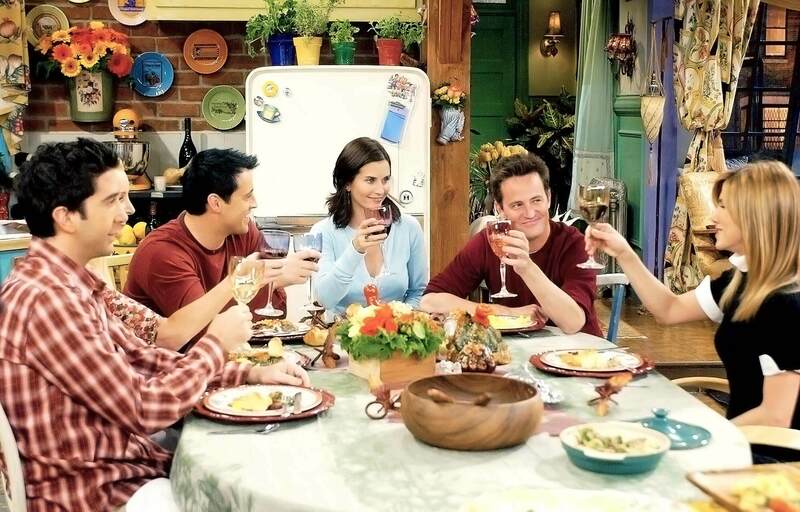 This year, let us all spend Thanksgiving in Monica Geller’s apartment, with the whole gang, Rachel, Ross, Joey, Chandler and Pheobe, and remind yourself that we are thankful for these classic episodes. Standing on a cosy 5th position is the show’s first Thanksgiving episode, which was a complete failure for all its characters but ended up being a classic one at best. We learn for the first time that Chandler hates Thanksgiving, and agrees to join in on the fun if there is grilled cheese and Funyuns on the table. Rachel tries to earn enough join her family’s annual skiing trip, and the gang chips in to get her a ticket. Joey had to cancel his plans to visit his family, after appearing on a VD ad. The gang inevitably gets locked out of their apartment, and their dinner gets ruined, and they end up eating grilled cheese for dinner and were thankful for being together. We all can relate to that! We jump to very last season for this, as it had a special ending. It all started with the gang running late to Monica and Chandler’s Thanksgiving dinner, which she was reluctant to throw initially. Hilarity ensues as Joey using his weird staring trick to apologise about the delay. The chapter ended with the Monica getting the call from her adoption agency about getting a baby and it’s a happy turkey-day ending altogether. Rachel raises a toast: To Monica and Chandler… and that knocked-up girl in Ohio. This episode can be aptly described as ‘the one where all the secrets come out’. Mona is trying to find the right time to tell her parents about dating Chandler, as they do not have a high opinion of him. Meanwhile, Ross and Joey are trying to hurry through dinner to hang out with Joey’s attractive roommate, and Rachel, who is in charge of dessert, ends up making a mix of English Trifle, and Shepherd’s Pie and everyone pretends to love it to spare her feelings. However, in the heat of the moment, Monica blurts out the truth that it was Ross, not Chandler who smoke pot in high school, and that Ross married and divorced Rachel. Later Ross blurts out that Monica and Chandler are living together and Rachel learns she made a messed up the dessert. The Gellers end up loving Chandler, so all is well! Monica: Ross married Rachel in Vegas and got divorced… again! We are now coming down to our second best, which is obviously the one with all the Thanksgiving flashback stories. The series starts with Chandler’s parents telling a little Bing about their divorce, Joey getting a turkey stuck on his head, Chandler’s bizarre haircut makes a return, alongside fat Monica and the couple’s initial history. We also get a lean Monica, who accidentally cuts off Chandler’s toe, while trying to flirt with him. To apologise for the whole incident, Monica puts a turkey on her head and dances, and Chandler tells her that he loves her and immediately freaks out. Rachel: Joey got a turkey stuck on his head? Joey: Hey! It’s not how it sounds! The best one has to be the one with Brad Pitt, who was then married to Jennifer Aniston. Monica invites an old high school friend, Will (Pitt), to Thanksgiving, and finds out that he hates Rachel. Later everyone finds out that Will and Ross started ‘I hate Rachel Green club’ and spread a rumour about Rachel in high school that she had both male and female reproductive parts. Apparently, everyone, including Monica and Chandler had heard of the rumour, which makes Rachel now even mad. However, they figure out their differences and were thankful for the fact that they are going to have a baby together.